Want to work half the time but earn twice as much? Want to be your own boss? Towfix is your solution. 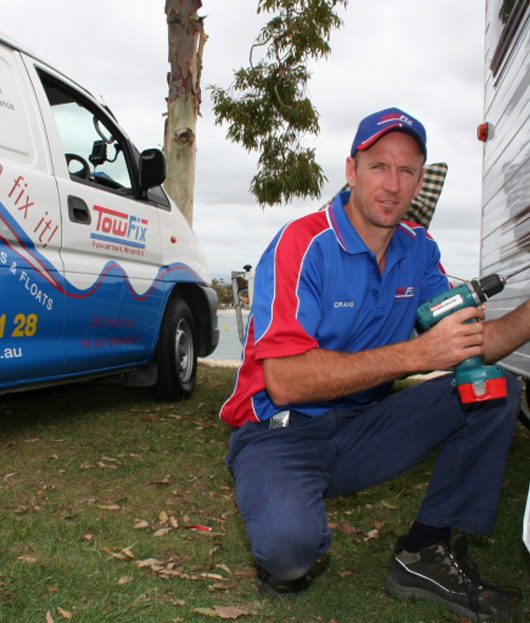 TOWFIX is an exciting mobile caravan and trailer repair business geared to onsite repairs. Established in 1997 to meet an untapped need in a booming market, we are currently looking for reliable and friendly tradesmen interested in operating their own TOWFIX franchise to manage the growing demand for our services. We Provide All Training to Get Our TowFix Technicians Maintenance Ready. So what sort of person will thrive with a TowFix franchise? They may come from many walks of life, but they will be the sorts of person who have a shed full of tools out the back. “Handymen” (no specific qualifications required). But most of all they will be people who are looking for a break….a break from the nine-to-five….a break from the rat race….a break from being cooped up all day. Interested, like to find out more?